Original design, keen pricing and stage ready - what’s not to like? If you can see beyond the classic designs but can’t afford a boutique build, we strongly suggest you check this guitar out. Nicely compact and well weighted. The Tricky is less hollowbody-sounding than we’d expected but it’s still hard to fault. Despite a reasonably low profile in the UK, Reverend is far from a new brand and the company celebrates its 20th anniversary this year. Originally conceived by Joe Naylor (who still provides the designs), the guitars used alternative materials and were made in the US. They’ve been made in Korea’s Mirr Music factory for some time now, but are QC’d and set up in the US (head tech Zach Green signs each one). The brand has attracted numerous names (Reeves Gabrels and Billy Corgan), and the guitars are available from a small number of UK dealers, not through a distribution chain, which all adds up to an attractive proposition both in style and price. One obvious thing about Reverend’s designs is that they don’t simply clone someone else’s body shape and call it its own. As per its set neck, the Tricky Gomez (a pun on Trini Lopez, not a signature artist!) uses the short ‘Gibson’ scale length, but angles back the distinct six-in-a-line headstock, binds the fingerboard edge and adds block inlays and a little extra meat to the neck depth. The body is the same ‘solidbody’ thickness of 44mm, but the Korina back is routed out to leave a centre block and hollow sides and capped with a bound-edge maple top. 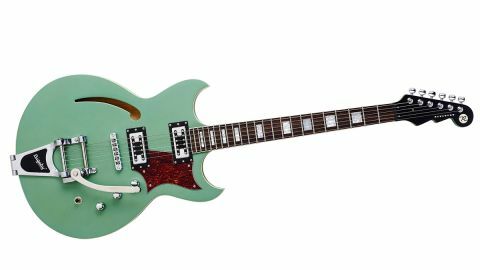 It’s based on Reverend’s Manta Ray outline, just over 356mm (14 inches) wide: more compact than an ES-335 and a good weight, too. The seemingly Gretsch-inspired and sized Alnico 5-loaded Revtron humbuckers sit in low profile rings with standard humbucking height adjustment and a double row of slot- head polepieces. With a little zing to its acoustic response, the Tricky Gomez doesn’t sound overly ‘hollow’ yet its compact size is a welcome change from an ES-335-alike centre- blocked semi. The heel-placed strap button means the guitar leans forward a little, but it’s hardly alone there and sits perfectly well. Sound-wise, we had no idea what to expect and it’s not particularly humbucking in terms of its low (coil-split-like) output with sounds to match. Compared with our reference Guild Starfire V, for example, it’s not only quieter but brighter, reminding us more of a Thinline Tele. It produces some stringy single-coil-like voices with a little roll-off that sounds more than usable with some dense modulation and reverb. Switch to some slapback and it’ll do rockabilly with ease - not quite a rubbery voiced Gretsch in the mix position, but good enough. On heavier gains it’s quite lively, a little more feedback-resistant than our Starfire, but less woody and more direct sounding. At this direct-to-dealer price, there’s very little wrong with this guitar and an awful lot that’s right. It has a refreshingly original design, sharp, competent build and perfectly usable sounds.